Daredevil #5 not only revealed that Matt is about to go up against some of the biggest baddies in the Marvel Universe. It also finally revealed that he does, in fact, own and use a personal computer. True, the first revelation is much more spectacular, but considering my past record of every so often pointing out that Matt has seemingly had to get by without one for more than one hundred issues, it’s appropriate that I also acknowledge this much appreciated return to form. Although, it’s not so much a return to anything as a much needed update to the book’s title character and his world. But first, let’s back up a bit. People who know anything at all about Daredevil will likely know two things: He’s the superhero with the snazzy all-red devil costume and he’s blind. Of course, people’s understanding of the latter is somewhat complicated by his heightened remaining senses. Because of his sensory enhancements, Daredevil is not only a relatively believable superhero, he also is able to avoid or lessen many of the difficulties his blindness would otherwise cause in his daily life. However, this is true only to a degree as there are certain tasks that specifically require “normal” vision. 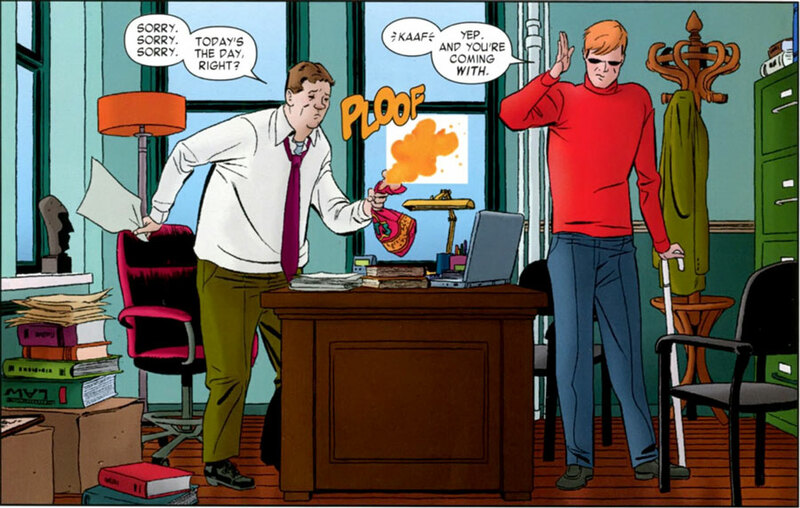 I suspect that if computers had been commonplace back in 1964, Stan Lee would have come up with a way for Matt Murdock to read the screen by touch. In fact, writer D.G. Chichester actually introduced such an ability in the early 90’s, though it was fortunately short-lived. And I say fortunately because being able to manually decipher anything from a screen represents a rather extreme stretch of Daredevil’s sense of touch as it was originally conceived. In my opinion, it also would have meant taking one step too far in the direction of reducing Daredevil’s blindness to only a technicality with no functional implications whatsoever. That may be desireable to some fans, but probably not most. 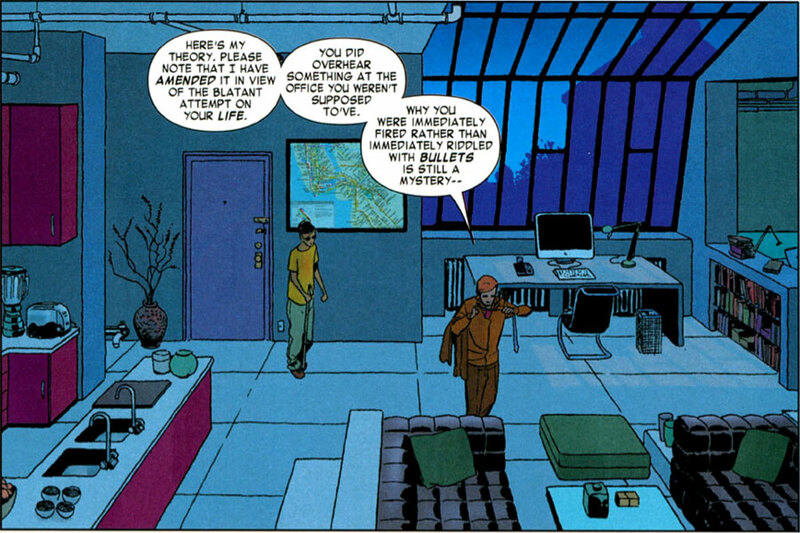 However, as the brief reading computer screens by touch era passed, there was very little else to replace it and for the longest time, the computer – arguable one of the most ubiquitous pieces of technology of the modern world – seemed completely banished from Matt Murdock’s life. With the exception of one scene from Kevin Smith’s and Joe Quesada’s Guardian Devil arc in which Matt is seen using a computer in his office, and a cameo appearance as a background element in the Playing to the Camera arc, I literally haven’t seen a computer anywhere near a surface with Matt’s name on it since. It’s almost as if the character went from one extreme – playing touchy-feely with his monitor – to another in which he was seemingly the only lawyer (sighted or blind) in the country to somehow get by without email, the Internet or even basic word processing. So, the panel above, in all its simplicity, actually makes quite a statement compared to the previous several years of having Matt stranded in a technological no man’s land. I also have to give two thumbs up to a very perceptive Marcos Martín for drawing it without a mouse. People with little to no vision who rely on screenreaders to interact with their computers have no use for computer mice, relying instead on the keyboard. It also looks as if Matt’s computer is an iMac, in which case this post can also serve as a belated Steve Jobs tribute. 😉 The latest versions of the Mac operating system also comes equipped with a full-featured (and increasingly popular) screenreader called VoiceOver which works right out of the box on any new Apple computer so in the event Matt would ever want to sneak a peak at Foggy’s email, he certainly could (since Foggy’s computer, pictured below in Daredevil #1, also looks like it might be a Mac). 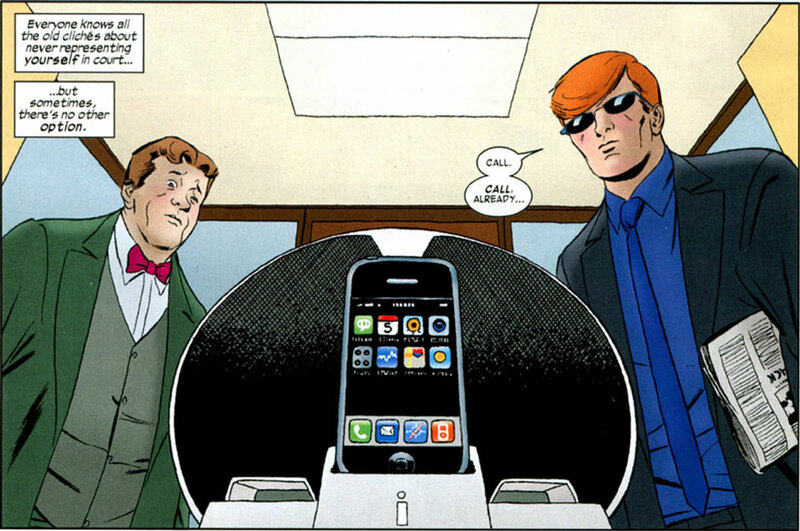 Further evidence that Matt and Foggy are in the Apple camp comes from the scene below, from Daredevil #4, where they’re waiting for a call to come in on what is obviously an iPhone. I sure hope they can get some product placement money out of all this advertising! 😉 The phone below could easily belong to either Matt or Foggy. In its earlier versions, the iPhone was inaccessible to the blind, but these days even the iPhone and iPad come equipped with versions of the same VoiceOver program you’d find on a Mac. I, too, punched the air when Matt got a computer. It was something that had puzzled and annoyed me for years–how does he function without one? And why doesn’t anyone use his inability to read a normal screen as a plot point? 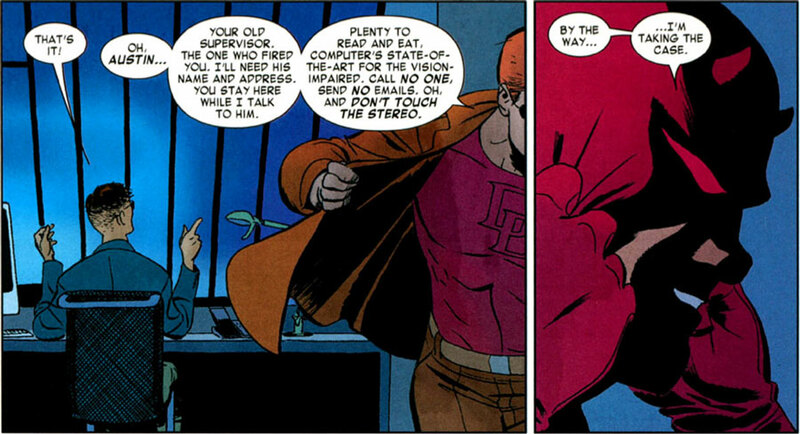 I always thought part of the fun of the character was that Daredevil “passes” for sighted–yet he can’t read things without touching them and giving himself away. So I’m delighted to see him join the ranks of the computer-literate, and so nonchalantly too! Well, the thing with the iPhone is that it’s more likely people would overhear the phone telling HIM stuff than the other way around, unless he’s already onboard with that new Siri feature on the iPhone 4S. 😉 The way VoiceOver works on the iPhone is really pretty cool. They’ve found a pretty neat way of making typing on a touch screen (and a bunch of other things) actually work even for people who can’t see what’s on the screen.